You have to pay attention to what he's not saying. Of course he's never "heard" of Geosensus, since Geosensus only exists in non-auditory media! Why would he bother with such clever equivocation if he weren't hiding the truth? This only strengthens the case. Edited by Locoman, 07 March 2019 - 04:20 PM. We're overlooking the man behind the curtain here. A few hushed whispers of editorial guidance form one J. Barber and Ruckley is dancing to tunes he doesn't even know are playing. Yeah, like Japan using the name "Nemesis" in Beast Wars Second for what was essentially the same finale plot device as in Beast Wars, before the name saw any use in American TF fiction, and without Mainframe's awareness. Or Simon Furman coming up with the Dark Essence around the same time as Japan's coming up with Angolmois Energy, which was again pretty much the same thing. And Hasbro years later creating a third variant of the concept in Dark Energon with, similarly, a lack of familiarity with Angolmois Energy. Er, um, I, uh, I mean... Look, there! His Tweet specifically responds to an inquiry about a character named "Geometus" being inspired by Geosensus! His denial says nothing of Geomotus's inspiration! Ha! The fiend is up to something! Up to something, I say! Edited by Sabrblade, 07 March 2019 - 04:34 PM. A bolo new era of stege! If I didn't already consider every artist who steps up to do regular issues of a TF book a damned hero, I definitely would now that this reboot comes with toy-based character designs that seem to enforce at least 50% more linework for every page they show up on. Pinky's sister Maud Pie is a rock specialist who's emotionally vacant and prone to long monologues about rocks, as well as talking to them more personably than she does to other ponies. All geologists have social problems. It's a rule of fiction. Ah! You're right. I admire his opportunism, incorporating Verity's slip-up so smoothly into his false front. Let's all double-check ourselves, that we don't give him more opportunities like that. The Dutch company made him!!! There are only two things I can't stand in this world: People who are intolerant of other people's cultures, and the Dutch. Another interview, this time with Ruckley. The tfwiki still exists so you can gain more information about things you don’t know or have not read. I quite enjoy looking up obscure characters to see who I have missed. I like to think of possible toys those without any depiction could have. Maybe Ruckley didn't use Geosensus because he wanted to make his own mark on the franchise after being given a wide open sandbox and told "go nuts?" Like, were people like this when Rung was invented back in 2012 and Roberts didn't use one of the eleventy thousand forgettable Micromasters? Everyone's always complaining now about how everything has to be G1, and now people are upset that Brian's making a new character and not using some rando whose sole defining trait was that he was a weirdo who got fridged. Edited by Locoman, 08 March 2019 - 06:09 PM. I don't know about you, but I hope Geomotus is revealed to be literally God. Why the name change, does the Dutch company own "Primus"? Uh, Bass? Those posts were from a point in this thread when almost everyone began making completely facetious posts. Not sure if serious since Bass quoted Romeo and Juliet. 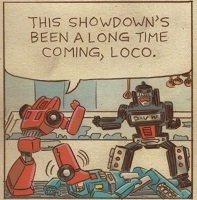 His response to Locoman's post sure seems like he missed its jestful nature.